Wooden bath frames, and all the hassle of constructing them, are now a thing of the past. 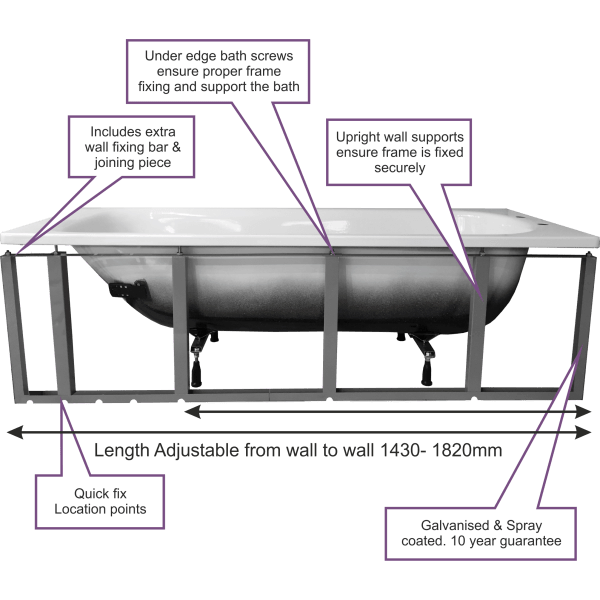 Getting the correct heights for your bath framework as well as securing the frame under the lip of modern bath designs has always been one of those frustrating and time consuming jobs when installing a bath. But these issues are no more due to an innovative way of frame construction that is set to revolutionise bath frames and finishes. AN EARLY BATH FOR WOODEN FRAMES FRONT PANEL FIXING KIT Cost effective, time saving and simple to assemble. Also provided is space for a bath panel or tile backer board for the perfect finish. The frame can be inset (depending on the size of the bath lip) to allow for the finish of your choice. The front frame can be used by itself or in conjunction with an End frame Kit.